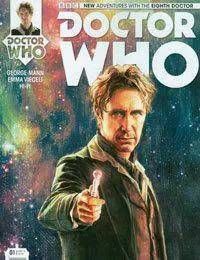 IM THE DOCTOR, AND ID VERY MUCH LIKE TO KNOW WHAT YOURE DOING IN MY HOUSE...Get ready for an all-new season of comics adventures featuring the Eighth Doctor, as played by Paul McGann in the Doctor Who movie, fan-favorite minisode Night of the Doctor... and over fourteen years (and counting!) of astounding Big Finish audio spectaculars!Five amazing, interconnected new stories take the Doctor on a rollercoaster of threat and misadventure, as he investigates the mysteries surrounding his new companion Josie. Victorian magic shows, murderous trees, lost books, crystalline life-forms, barges in space crammed with the undead... and the grand journey all begins in a sleepy Welsh town... besieged by living paintings!